The Extended Cold Weather Clothing System (ECWCS) is a layered insulating system adjustable to personal preference, metabolism, and prevailing weather conditions. It is designed to maintain adequate environmental protection between +40°F and -60°F. The original ECWCS is composed of 23 individual clothing, handwear, headwear and footwear items which are used in various combinations to meet cold weather environmental requirements. Polyester fiberpile shirt and bib overall, field trouser liner. Field coat liner and field trousers. snow camouflage parka and trousers. Light duty glove shells and inserts, trigger finger mitten shells and inserts, arctic mitten set, snow camouflage mitten shells. patrol cap, combat vehicle crewman's hood (balaclava). Wool cushion sole socks, vapor barrier boots (black and white). TC 21-3. 1986. Section 4, Chapter 2. TM 10-8400-201-23. Change 3. 1993. Chapter 20. 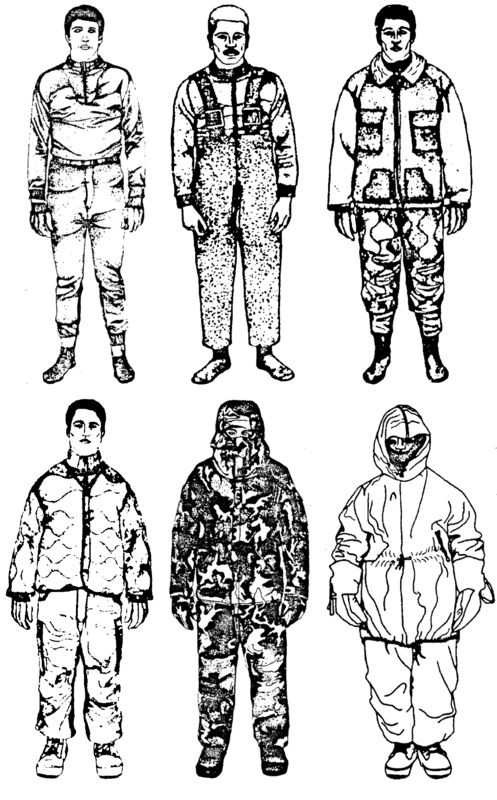 "Army Cold Weather Uniform and Equipment Posture". ATTP 3-97.11. Appendix A. "Laundry Washing Formulas". FM 42-414. Appendix E.
TB MED 508. Appendix D.
FM 31-70. Chapter2. Section II.